Volkswagen has lately been going through a dull phase in India. There haven't been any new models that have rolled out for quite some time now. The Polo and Vento are being constantly updated, but there has been the need for an all-new car. But now it looks like the German carmaker is going to be very busy during the second half of 2016. They plan on entering segments that they have never been part of before in our market. One of the cars that will make it to India is the Volkswagen Passat GTE. 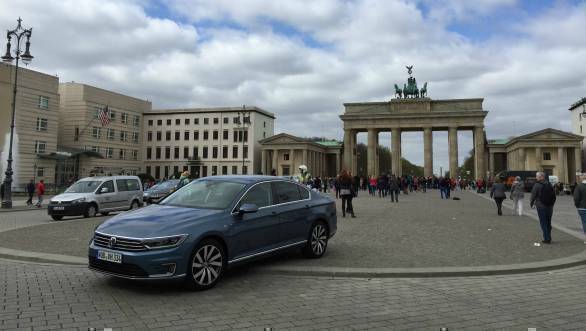 The plug-in hybrid version of the Passat was recently launched in Europe. The car is based on the new generation B8 model that has been awaited for a while now, especially since Skoda's all-new Superb has hit Indian shores already. We drove the GTE in and around Berlin and here's what we think of it. The new generation Volkswagen Passat has a lot more presence when compared to the earlier model. It's a larger car now (though shorter in length) and the evolved design goes well with the new footprint. The front end is elegant and at the same time slightly aggressive. The smart headlamps feature chrome strips that neatly blend into the front grille. While the regular Passat has only chrome, the GTE gets blue detailing on the strips to go with the car's hybrid theme. The other changes include repositioning of the daytime running LED lamps. They have moved from the headlamp to the lower section of the more pronounced front bumper. 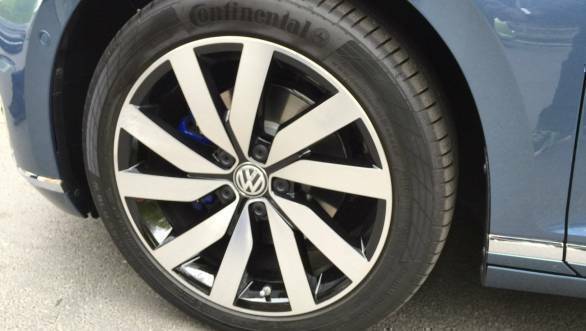 The sides are sleek yet remind you of the earlier Passat. 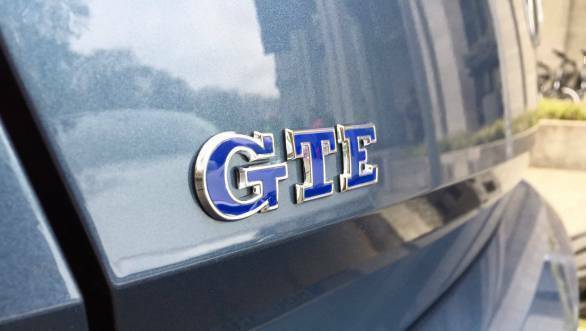 The GTE gets different side badging and specially designed alloy wheels. The brake calipers are also finished in blue. Move to the rear and you won't see a Passat badge, but you know it's a Passat thanks to the evolved design. The angular tail-lamps are a split type unit like before but a lot more sharp and better detailed. The bumper houses neat chrome-outlined trapezoid exhaust trims as well. Step inside and it's very different to the Volkswagens we are used to seeing in India. This feeling arises since there haven't been any all-new models that have made it to our market in a while. The interior styling like before is elegant and functional but the design language has also focused more on style. There's more detail now and the quality of materials and build is significantly improved. The new Passat features an all-digital instrument cluster and since it's a display, the screen can offer various information based on the situation. The dials for example can be customised depending on the driving mode or can be made smaller in size so that a lot more info is displayed thanks to the freed space. 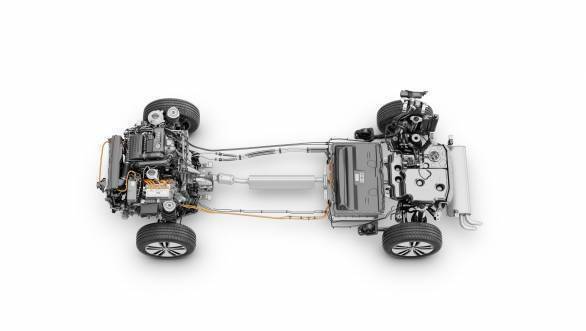 The GTE gets some more additions that are specific to the plug-in hybrid's drive system. There's quite a bit of blue highlighting inside too like blue decorative stitching on the steering wheel and gear knob.There's a lot of space for five adults, the front seats offer great support and comfort while the rear gets better knee room and shoulder room. The batteries are placed in front of the rear axle while the fuel tank moves under the boot. The boot loses about 180 litres of space but the loading bay is still flat. There is no spare wheel for the European market and it'll be interesting to see where a spare wheel can be positioned when it comes to India. The highlight of the GTE is the plug-in hybrid system. The car features a direct-injection 1.4-litre TSI petrol engine that produces 156PS and an electric motor powered by a lithium-ion battery that delivers 115PS. The total system output is an impressive 218PS and 400Nm. 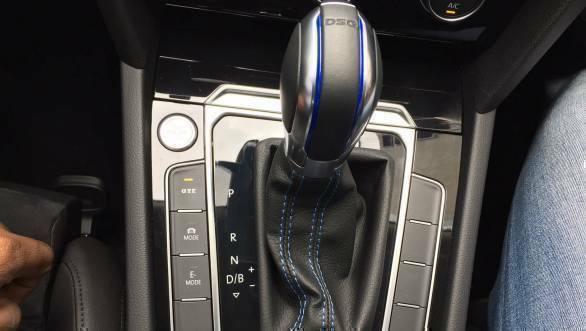 A 6-speed dual-clutch transmission has been developed specially for the hybrid drive system. Hit the start button and you won't hear the GTE come on since it's only the electric motor that wakes up (unless the battery runs out of juice and the temperature is too cold outside). 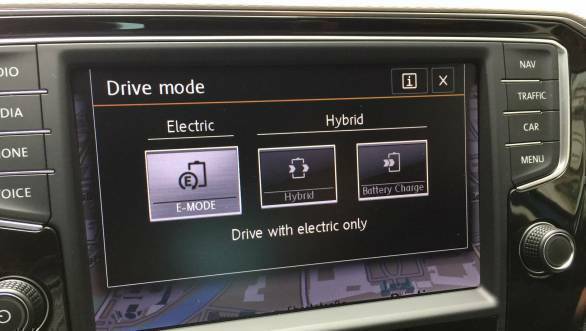 There are however three driving modes  E, hybrid and GTE. In E-mode it's a pure electric drive and one can drive up to 50km on a full charge. On our drive, the range displayed was about 37km. The drive route was a mix of both town and highway driving. While I was gentle on the throttle in town, on the highway, the car did speeds up to 120kmph (claimed top speed in E-mode is 130kph). The car however ran out of battery after driving about 22km. The total range changes according to driving style. The battery can be charged at home using a wall box provided by Volkswagen in just two hours and 30 minutes, or by using a charging cable that's plugged into a regular socket in four hours and 15 minutes. The car's socket is placed behind the front radiator grille. Time-delayed charging is also possible by setting the timer using the infotainment system or a mobile app. In hybrid mode, the car drives like a typical full hybrid vehicle. The integration between the TSI engine and the electric motor is seamless. The battery is charged regeneratively during deceleration while the TSI and/or electric motor power the wheels based on the situation. We drove another 20-odd km in hybrid mode and during this time the battery charged slightly. E-mode driving range went up from 0 to 8km. 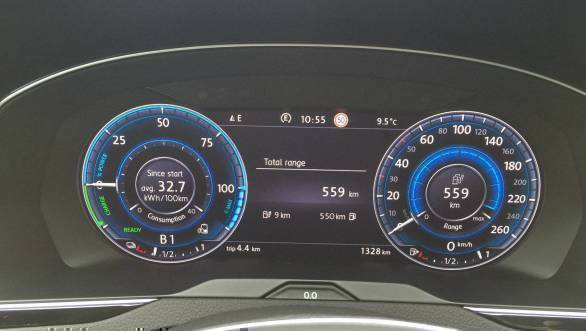 It was a good feeling to see extra kilometres added to the range without having to actually charge the car using a power source. It was however time to check out the fun GTE mode. This setting offers the highest power and torque for a more performance oriented drive. The TSI motor uses a different engine map, the gearbox offers quicker shifts and the steering offers more weight too. One can also change individual settings, but the GTE mode sets all of it to the sportier tune. Not to forget, the engine note sounds a lot more deep in this mode. The folks from Volkswagen did tell us that the instant torque available from the electric motor combined with the impressive TSI engine does make the car quicker than a regular Passat. I dismissed that as a marketing spiel but all that changed when the ESP warning light started flashing. The wheels were fighting for grip as I stepped on the throttle. The GTE can be quite entertaining too, I like the fact that it offers the best of both worlds. Claimed top speed is 225kmph while 100kmph comes up in an equally impressive 7.4 seconds. 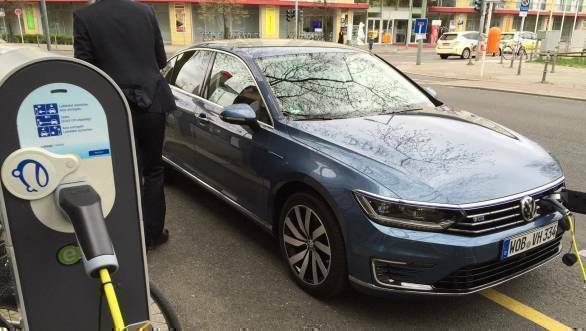 The car is heavier to the regular Passat by about 200 kilos thanks to the electric motor and systems. The chassis is also better reinforced at a few points. The GTE is still a fun car to drive. The car will be the first Volkswagen car to use the MQB platform in India. All independent suspension and optional adjustable chassis setup makes the GTE quite a capable handler. 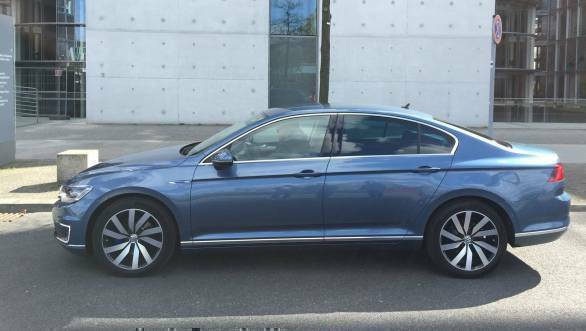 High speed stability is good and in town the car feels a lot more agile than the previous generation Passat. The car offers a good ride and at the same time stays planted around corners. While total global sales of plug-in hybrid cars are expected to quadruple in the next two years, India is still getting introduced to such cars. The country is currently trying hard to counter the high pollution levels in major cities and it's a good time for Volkswagen to introduce the Passat GTE. The government is also offering incentives under the FAME scheme and it's definitely a step in the right direction. Volkswagen will most likely offer the Passat diesel in India during the festive season this year. We expect the car to be assembled locally so prices will be competitive (expect prices to start at Rs 25 lakh, ex-Mumbai). The GTE however will be a CBU and hence will cost at least twice as much. Volkswagen doesn't expect to sell high numbers in India but the GTE has all it takes to improve the brand's image.